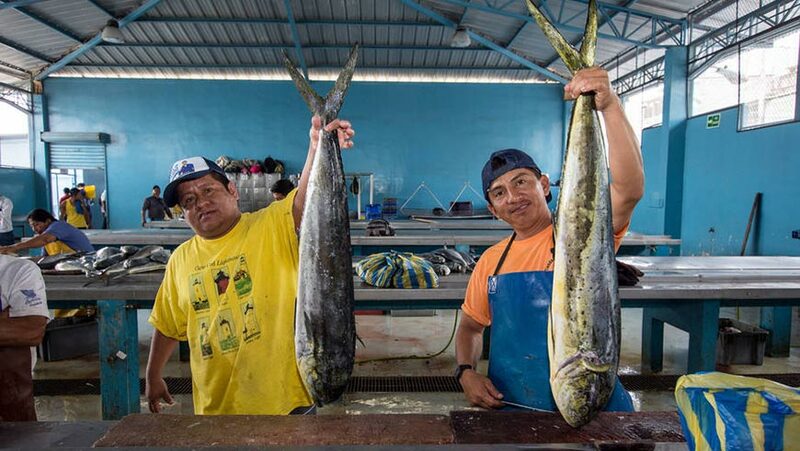 Mahi-mahi is important for the Ecuadoran economy and for domestic consumption. FAO and Peru are working to sustainably manage the species, one of the components of the CFI Latin America project. Photo: FAO. The challenges and achievements experienced by coastal fisheries communities spanning three continents was the topic of discussion last month in Guayaquil, Ecuador at the GEF Coastal Fisheries Initiative Global Inception Meeting. Forty participants from countries spanning three continents, international organizations and non-governmental organizations met last week in Guayaquil to launch the GEF Coastal Fisheries Initiative (CFI) at a Global Inception Meeting for the GEF-financed programme. The programme is aimed at strengthening coastal fisheries communities across three continents. This Global Inception Meeting follows on the first Coastal Fisheries Initiative workshop held three years ago in the medieval town of Vitorchiano, Italy – north of Rome. This workshop brought together partners and worked on designing the three original regional project proposals for Latin America, West Africa and Indonesia. You can see a wrap-up of the workshop here. Last month in Guayaquil, on Tuesday, 23 October, Susana Villacis, Vice-Minister of Fisheries and Aquaculture of Ecuador, Erasmo Otárola, National Director of the Coastal Fisheries Initiative for Latin America, and Mónica Andrade, Director of Environment and Energy, UNDP Ecuador, welcomed delegations from Latin America (Ecuador and Peru), Asia (Indonesia), and West Africa (Cabo Verde, Cote d’Ivoire, and Senegal, the latter was, unfortunately, not able to attend in person) to the Global Inception Meeting held 23-26 October. These country delegations were joined by officials from partner international organizations, including GEF, FAO, World Bank, and UNDP and partner non-governmental organizations that include WWF and Conservation International. All regional projects are working in close collaboration with Ministries and regional authorities to determine country priorities and to implement country-level activities. A full three days of workshops allowed the participants to present planned activities for their country and regional activities, to exchange knowledge and experiences across projects, and to address challenges such as how to assess fisheries and monitoring and evaluation. ‘Speed dating sessions’ designed to spark dialogue across regional projects was especially rewarding, as regional projects learned from each others’ experiences, and identified areas for future collaboration and south-south knowledge sharing and training. The country-level projects are tackling a wide range of issues and activities, including participatory approaches to fisheries management in shared marine protected areas in Peru and Ecuador, innovative financing mechanisms in Indonesia, and building stronger value chains in western Africa. One of those areas identified for cross-continental collaboration and learning was the sustainable management of mangroves. Fishermen and fisherwomen in the mangroves of Ecuador, areas that are included in the Coastal Fisheries Initiative, came to the meeting to present the work they are doing, alongside the inspectors who ensure these communities are sustainably managing their resources and harvesting within the allowable quotas each fishermen or woman can harvest within the concession areas. In Ecuador, all mangroves are publicly owned. Fisherfolk group are provided with 10-year concessions if they sustainably manage the resources. The inspectors for the community also spoke to the participants, explaining how they ensure the fish and crabs harvested are the correct size, and they work with the communities to implement sustainable tourism policies that help attract ecotourism, boost the communities’ income, and also place an emphasis on sustainable management and conservation of these protected areas. Fresh Mahi-Mahi caught in the morning and being prepared the same day for lunch at a port-side Santa Rosa restaurant. Photo: FAO. Two of the African countries involved in the Coastal Fisheries Initiative – Cote d’Ivoire and Senegal – include a mangrove component in their activities. The African participants spoke with the Ecuadoran community groups and inspectors and look forward to a sharing of approaches and lessons learned between the two continents as they undertake fisheries activities in their mangroves. The Coastal Fisheries Initiative also includes two additional projects that, amongst other things, will create a fisheries performance assessment tool to benefit countries with little available data and technical assistance from the World Bank in order to facilitate private investment in ecologically and financially sustainable fisheries enterprises. On the final day of the conference week, participants also travelled to Santa Rosa, along the Pacific coast, to visit fisheries activities that are taking part in the Coastal Fisheries Initiative and learning about activities to strengthen fisheries management and participatory approaches within marine protected areas. Participants were hosted by the local fisherfolk association, Santa Rosa de Salinas Artisinal Fisheries Production Cooperative, and learned about management activities underway to support small-scale fisheries communities during the Mahi Mahi and tuna-fishing seasons. Inspectors from Ecuador’s Ministry of Aquaculture and Fisheries were also on hand to explain to participants how controls are carried out and the documentation completed at landing. They also reviewed traceability systems and work undertaken as they move from a paper-based to an electronic system. Participants from UNDP Ecuador, WWF Ecuador and Conservation International Ecuador also spoke about the early successes of these activities in moving towards sustainable fisheries among these small-scale fisheries communities. They cited success in achieving commitments from all involved – from fisherfolk working to reduce their impact on their local waters, managers properly monitoring the catches, and policy makers supporting efforts with suitable management measures. Continued work in these areas and lessons learned with other regions will be a key component of activities within the Coastal Fisheries Initiative programme. A busy morning for small-scale fisherfolk at the bustling Santa Rosa port. Photo: FAO. A successful week of planning, programming, communication and knowledge sharing, and an exchange of ideas and plans for joint activities drew to a close. As the project activities move forward, each region anticipates the opportunities for reflection and a sharing of experiences with the other regions. Despite differences in language, geographies and cultures, coastal communities face remarkably similar challenges as they work towards achieving successful, well-managed fisheries. The projects under the Coastal Fisheries initiative are very much looking forward to working together to achieve their objectives in their regions, and count on the support and knowledge sharing spanning continents to move them closer to their goals. We will continue highlighting their stories on the Blue Growth blog, on the CFI web site and through the #CFIgef hashtag. This story originally appeared in the Blue Growth blog of the FAO.